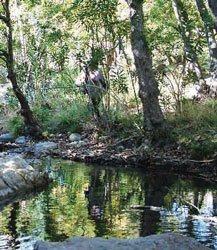 From Kinidaros, a rough country road leads to a lush green valley, through the bottom of which, runs a river. You can leave your vehicle at Kinidaros and continue on foot. On the east­ern side of the valley (at Halandra) there are two ruined churches, Agios Artemios (built in the 18th century) and Agios Dimitrios. It is said that at the same spot there was an ancient temple which was associated with the wor­ship of the goddess Artemis. From here travelling in a westerly direction, along the banks of the river we find an old stone bridge, small waterfalls, butterflies, water-turtles and lots of abandoned water mills.